The Lord spoke to Moses, saying: Say to the Israelite people: On the fifteenth day of this seventh month there shall be the Feast of Booths to the Lord, [to last] seven days. The first day shall be a sacred occasion: you shall not work at your occupations; seven days you shall bring offerings by fire to the Lord. On the eighth day you shall observe a sacred occasion and bring an offering by fire to the Lord; it is a solemn gathering: you shall not work at your occupations. Those are the set times of the Lord that you shall celebrate as sacred occasions, bringing offerings by fire to the Lord — burnt offerings, meal offerings, sacrifices, and libations, on each day what is proper to it — apart from the sabbaths of the Lord, and apart from your gifts and from all your votive offerings and from all your freewill offerings that you give to the Lord. Mark, on the fifteenth day of the seventh month, when you have gathered in the yield of your land, you shall observe the festival of the Lord [to last] seven days: a complete rest on the first day, and a complete rest on the eighth day. On the first day you shall take the product of hadar trees, branches of palm trees, boughs of leafy trees, and willows of the brook, and you shall rejoice before the Lord your God seven days. You shall observe it as a festival of the Lord for seven days in the year; you shall observe it in the seventh month as a law for all time, throughout the ages. You shall live in booths seven days; all citizens in Israel shall live in booths, in order that future generations may know that I made the Israelite people live in booths when I brought them out of the land of Egypt, I the Lord your God. 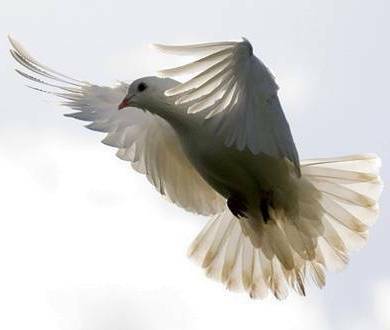 The Midrash teaches: “Just as a dove (yonah) is simple and accepts authority, the Jewish people accept God’s authority by ascending to Yerushalayim during the holiday. Just as a yonah is distinguished to its partner, who can tell it apart from other birds, Klal Yisrael are separated from the non-Jews by how they cut their hair, their fulfillment of milah and their care to wear tzitzis. The Jews comport themselves with modesty, like doves…Just as doves atone, Yisrael atones for the nations when they bring the sacrificial bulls for them during Sukkos. Wait a minute. Besides the part where it said “Klal Yisrael are separated from the non-Jews,” what did that say? 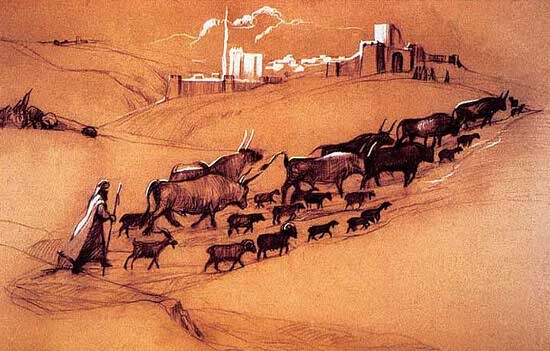 Just as doves atone, Yisrael atones for the nations when they bring the sacrificial bulls for them during Sukkos. Yes, that’s what I thought it said. The Talmud (BT Sukkah 55:B) teaches that the seventy bulls that were offered in the Holy Temple served as atonement for the seventy nations of the world. 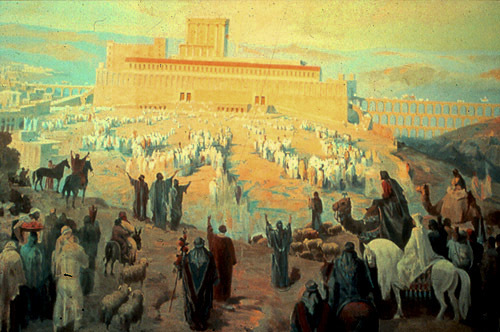 Truly, as the rabbis observed, “if the nations of the world had only known how much they needed the Temple, they would have surrounded it with armed fortresses to protect it” (Bamidbar Rabbah 1, 3). -quoted from The Temple Institute website. The irony involved in this commentary is that even though the nations hate Israel and destroyed her Holy Temple, still the Jewish people continue to pray for the peace and redemption of the nations. Sukkot is the only festival of the Jews when representatives of the nations of the world will be actually commanded to appear in Jerusalem to celebrate and, as you see, God desires this so much, that there will actually be penalties for nations refusing to be represented at this event in the days of the Messiah. Prophetically, Sukkot anticipates the coming kingdom of Yeshua the Messiah wherein all the nations shall come up to Jerusalem to worship the LORD during the festival. But that’s all in the future. What about now and especially, what about in ancient times? Has Israel been atoning for us all along and have we disastrously ended our own atonement before God by destroying the Temple and scattering the Jewish people throughout the earth? Salvation for the nations comes from the Jews. It seems like our atonement in ancient days came from Israel and for those of us who are Christians, it continues to come from Israel even though the Temple in Jerusalem currently does not exist. We from the nations cannot escape the great gift that Israel has continued to bestow upon us from days of old until this very time. God made Israel a light to the nations (Isaiah 49:6) and that light has been allowed be spread from Israel and the Torah to the rest of us (Isaiah 2:2-4) so that we too can illuminate the world with that light (Matthew 5:14). But this is only possible because God sent the Jewish Messiah and King, our Master, to all of us. And this is only possible because the Messiah and Savior was as obedient as a dove (Matthew 3:16) and as silent as a lamb led to the slaughter (Jeremiah 11:19). The Christian church hasn’t replaced Israel and we certainly haven’t merged into her so that Israel has ceased to be a people before her God. We among the nations are Israel’s beneficiaries. May we continue to bless the heart of Zion and her first born son, Jesus Christ, our Savior, King of the Jews. That which can be grasped will change. That which does not change cannot be grasped. He is the elusive, unchanging dove.